By John F. McKenna (McJack): World Boxing Organization (WBO) welterweight champion Manny Pacquiao (53-3-2, 38 KO’s) is training incessantly for his showdown with WBO/WBA lightweight champion Juan Manuel Marquez (53-5-1, 39 KO’s). “Pacman” and “El Dinamita” will face each other for the third fight of their Trilogy on November 12 at the MGM Grand Arena in Las Vegas. There are concerns within the Pacquiao camp that the Filipino icon is overdoing it in the preparation for his showdown with Marquez. Manny is leaving no stone unturned in his determination to prove to the world that he is a superior fighter to “El Dinamita”. He has approached his training regimen like a man possessed, even starting training ahead of time. In addition, Pacquiao began running before the introductory news conference in the Philippines. Marquez has succeeded in getting under Pacquiao’s skin big time with his constant assertions that he was robbed of victory in their first two fights. The first Pacquiao – Marquez fight in 2004 was called a draw even though Marquez was floored three times in the first round. Manny won a controversial decision in the second fight. Many boxing fans feel that Marquez won the second fight. Marquez believes he was deprived of victory in bought matches. What was particularly galling to Manny was Marquez showing up in his homeland, the Philippines with Tee shirts complaining that he was robbed. Pacquiao took that as an insult. He has confided to close friends that he does not want to leave the outcome of the fight in the hands of officials. Pacquiao, however has to guard against over-training which was apparently the reason he had leg cramps during his bout with Shane Mosley last May. The danger of Manny over-training in his upcoming match with Marquez exists. His wish to demolish Juan once and for all may in the long run be his undoing. Marquez is a smart, cagey fighter. Part of his strategy may be to get inside Pacquiao’s head and get him to “leave the fight in the gym” so to speak. Manny would not be the first fighter to peak too soon. To work so fervently in training that come fight night there is nothing left. Trainer Freddie Roach is only too well aware of Manny’s tendency to overdo things in training. Top Rank CEO Bob Arum recently warned Freddie to slow Pacquiao down. Easer said than done. Pacquiao is addicted to training and just like any other addiction it could be his undoing. Over-training may in the long run achieve what no other fighter has been capable of doing, that is to defeat Manny Pacquiao. 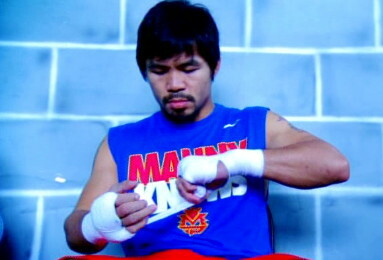 Boxing » Manny Pacquiao » Is Pacquiao overdoing it?